Photo courtesy of the Delaware Department of Agriculture. The Delaware Department of Agriculture (DDA) has a strong history of preserving farmland. For 20 years, Delaware has purchased development rights from landowners in annual rounds, investing $219 million into Delaware’s agriculture industry. The success of the agriculture land preservation program is attributed to a competitive bidding process in which easements are purchased at an average 56 percent discount off the appraised value. This allows farmers to make some extra money off their land while continuing to farm it. DDA now holds permanent agricultural easements on 866 farms covering 122,000 acres of Delaware land. Additionally, DDA holds 425 temporary 10-year easements on another 55,000 acres. Because these easements remain privately owned, DDA monitors them to ensure that landowners continue to comply with development restrictions. The inspections themselves are not complicated, but manually managing the related data and photos was becoming challenging and costly. So DDA enhanced its use of the ArcGIS platform—and implemented Collector for ArcGIS—to streamline inspections and automate reports. Prior to 2016, DDA inspectors employed a manual workflow to conduct and report on site visits. They used paper maps to decipher property boundaries; recorded inspection notes on laptops; and used digital cameras to take photos of the properties, being sure to write down each property ID number on a piece of paper and photograph that before every inspection to keep the photos organized. After inspectors finished a set of hundreds of assessments, they would manually organize the photos by property ID, renaming each photo so it contained the ID and placing all the photos from each property into a folder. Inspectors then put the inspection results, photos, and captions into a report template, which contained a property map that had to be centered and edited to show the photo locations. This process took hundreds of hours each year. Managing the data and photos manually, as well as creating individual reports for each property, was tedious. Inspectors weren’t able to complete their reports until months after the inspections took place, generating a severe time lag. The workflow was clearly in need of an upgrade, and the staff was asking for improvements. Looking for a low-cost upgrade, DDA’s GIS coordinator, Jimmy Kroon, determined that he could use Collector for ArcGIS to enable mobile data collection and the Data Driven Pages in ArcGIS Desktop to automate the reports. The enterprise GIS team at Delaware’s Department of Technology and Information (DTI) had experience using Collector, so it assisted with designing the database and offered to host it in ArcGIS Server. To get started, Kroon and DTI’s GIS team designed a geodatabase that would support data-driven map documents for individual inspection reports. Then, the team adapted the geodatabase to be the backbone of the operation in Collector. Because the geodatabase structures for Collector and the data-driven map documents were slightly different, the team used ModelBuilder to create a model that transcribes records between them. 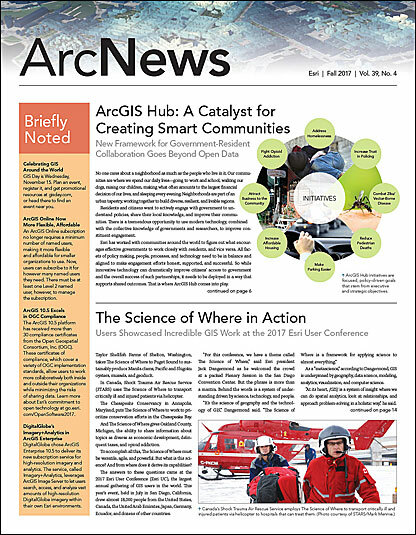 To test everything, Kroon first published the solution in ArcGIS Online. This allowed him to make quick modifications to the database schema and map symbology to ensure that the inspection workflow in Collector performed as expected. Once testing was complete, DTI’s GIS team published the solution in FirstMap, Delaware’s enterprise GIS, and created a secure editing environment. It took less than an hour for Kroon to train the inspectors on how to use the new solution. Within a week, DDA inspectors began using Collector to conduct a set of 306 farm inspections. They reported that the app was easy to use. 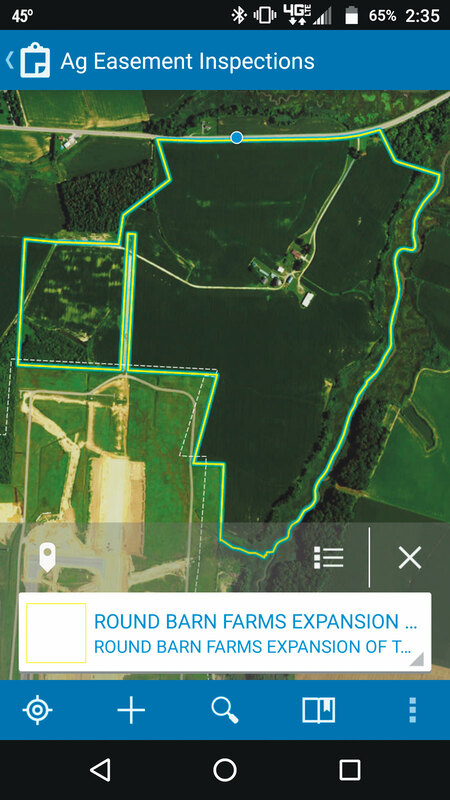 Having easement boundaries on a mobile map with real-time location details helped them get oriented quickly in the field. They liked being able to capture all inspection data and photos using a single device. And Collector’s offline capabilities made rural inspections much easier, since the inspectors didn’t have to search for mobile service to upload their data. Once the inspections were complete, Kroon checked the data for errors, converted it into the reporting schema, and aligned the report template map to the inspection database. ArcGIS Desktop exported every record as an individual PDF file, each named according to the property ID. Every report contains the inspection data that is stored in the attribute table; photos, which are stored as geodatabase attachments; and photo locations that are stored as related point feature classes. Now, exporting reports takes an hour or two of processing time (depending on the number of reports being generated) rather than weeks of manual effort. In the first year alone, DDA used Collector to inspect and generate reports for 730 easements throughout the state of Delaware. The map screen in Collector for ArcGIS displays easement boundaries and the inspector's location. One year after implementation, DDA looked back at the process and calculated its return on investment (ROI) for the solution. Indeed, it took much less time to generate reports. The staff was thrilled about not having to complete these assessments manually. And DDA’s funding partners were happy to be getting inspection reports more quickly. Even better, reports were now more thorough because they contained extra data pulled from the program’s GIS database and county GIS servers. During the ROI appraisal, DDA uncovered an unexpected benefit as well. Inspectors revealed that they were completing their site visits about twice as fast using Collector as they did with the old workflow. This was attributed to having data, real-time location, mapping, and photo capture all in one device. Kroon also gathered information on how long it took, on average, to complete reports using both the old and new workflows, and DTI’s enterprise GIS team helped estimate how long it took to create the solution. Additional costs, including purchasing new smartphones and a new cellular service plan with data, were also included in the detailed ROI report. In the end, DDA reaped very clear benefits from the new workflow. Setting up the solution required a one-time investment of 41 hours, and now DDA saves nearly 500 hours annually—75 percent of the time it used to take—on completing inspections. Generalizing employee costs for everyone involved in the inspections—including their average salary, health care and fringe benefits, and overhead expenses—DDA saved $22,710 in the first year and is slated to save more than $25,000 in each ensuing year. For more information about this project, email Kroon, MGIS.